Everyone has something they love to an absurd and irrational degree. And this love is often bizarre and incomprehensible to others. Like those who love The Grateful Dead. Seriously, what's the deal? Who wants to listen to a bunch of stoners tuning their guitars and noodling around aimlessly for three and a half hours? I kid, I kid. Sort of. I love Lagavulin. What can I possibly say about Lagavulin that I haven't already said or written? If you know me, or if you have ever read this blog, you undoubtedly know about my somewhat obsessive love for this nectar of the gods. It is also the preferred drink of moustachioed libertarian extraordinaire Ron Swanson and, not coincidentally, the drink of choice of Nick Offerman who portrayed Ronald Ulysses Swanson on Parks and Recreation. 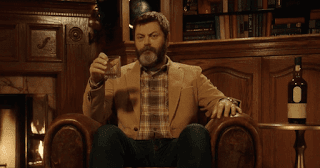 Offerman even teamed up with Diageo (corporate owners of Lagavulin, Talisker, Oban, Caol Ila, Dalwhinnie, Johnnie Walker and more) to produce a series of YouTube videos entitled "My Tales of Whisky". The collection includes "The Treasure of Lagavulin", "That's Not Lagavulin", "Lagavulin-Scented Holiday Gifts" and even an uninterrupted Yule Log video wherein Offerman sits by a fire whilst sipping Lagavulin. This may not appeal to everyone, but it's the kind of humour that tickles my fancy. However, Lagavulin Distillers Edition is different from the "standard" Lagavulin 16 Year Old. How you ask? Read on, friend. Lagavulin distillery is one of the three "heavy hitters" of the peat-heavy southern Islay distilleries, alongside the excellent Ardbeg and Laphroaig. Lagavulin has a long and storied history of feuds with Laphroaig that you can read about here (be sure to click on "discover more"), if you're interested. Lagavulin's range of whiskies is not extensive, but it doesn't need to be. The most common Lagavulin is the 16 Year Old, though Lagavulin usually releases a 12 Year Old Cask Strength malt almost every year. 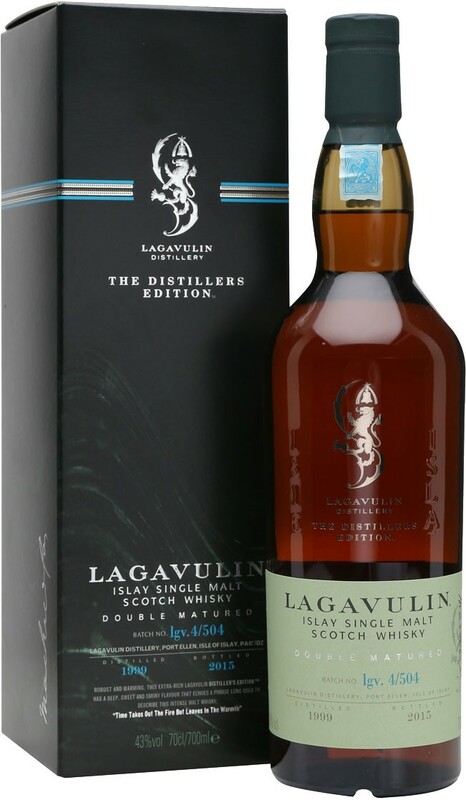 Diageo released an 8 Year Old Lagavulin in 2016 to commemorate the 200th anniversary of the (legal) founding of Lagavulin. So what is "Distillers Edition"? While Lagavulin 16 is mainly aged in refill European Oak casks, Distillers Edition is Double Matured. That means that some of the spirit is aged in European Oak while another portion of it is matured in Pedro Ximenez (sherry) casks. This is not sherry-finished, but double matured. This leads to a different flavour profile. Adding water initially brings out much more maritime character on the nose. You get hit with the briny, iodine smell of seaweed washed up on the shore, and more sherry fruitiness. Left to sit for another 5-10 minutes, the brininess gets toned down a bit and the big sherry nose is back, mingling with the beach smells. The flavour on the palate is not as immediately sweet once water is added, but is just as rich and unctuous. The first thing you taste by adding water is wood smoke, developing to sweet sherry, dark fruit and chocolate. The finish is a touch less smoky with water, but the dark chocolate is far more apparent. As odd as it sounds (or pretentious, depending on your point of view), adding water didn't change the aromas and flavours as much as it re-ordered and re-focused them. Either way, this Distillers Edition is a dram to linger over. A 1 1/2 oz. pour lasted me over an hour. Before you write me off as a snob (though the criticsm may be valid), know that I nose my Lagavulin as soon as it's poured, then again after 10 minutes sitting in the glass, then again after another 10 minutes. So the first 20 minutes features no tasting whatsoever. I then take a few small, baby sips neat. Then I add a teaspoon of distilled water, nose it immediately, let it sit for 5-10 minutes and nose it some more. Once you get past feeling silly about this process, it is very rewarding. The smells really do evolve, and no, it's not imagined. There is a scientific explanation for the chemical reactions that are occurring at the molecular level throughout this process, but I won't bore you with it here. Lagavulin is revered by many malt enthusiasts. Unlike other distilleries whose near-mythic reputations are the product of marketing rather than quality (*cough Macallan*), Lagavulin actually delivers the goods. Others may have had different experiences, but I've never encountered a bad Lagavulin. 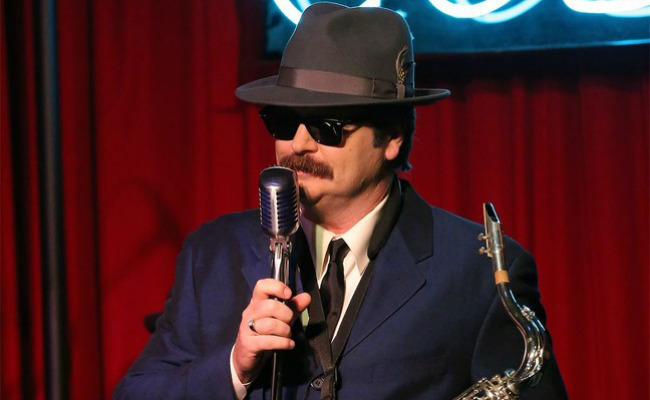 It is as solid and predictable as Ron Swanson's social and political views. Is Lagavulin Distillers Edition better than the "standard" 16 Year Old? Different, not better or worse. It would be impossible to decide which alter-ego is Andy Dwyer's greatest. Is Johnny Karate better than Burt Tyrannosaurus Macklin? Who could pick a favourite between Duke Silver and Ron Swanson? So it follows that comparing Lagavulin Distillers Edition to Lagavulin 16 Year Old is a fruitless endeavour. Both should be appreciated for the treasures they are, much like Li'l Sebastian. 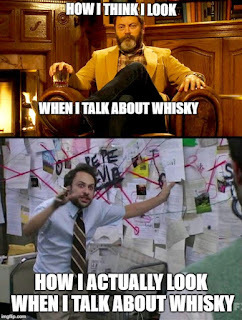 * I only kid about Macallan. I'm not a fan, though I know many people are. It's just a little humour, folks.